It’s not by chance that you’re reading this introduction. This book has chosen YOU!!! For you have been divinely guided at this right time of your life to understand this books important messages, just for YOU!!! This self help book is like no other. It is unique in the way that it links messages from the Animal Kingdom to your conscious mind. Improving our connection and awareness to what is really going on in our everyday life. This is a not a book to just read once and forget about. It’s a quick reference, self-help guide that you can use every day. Daily usage of this personal growth book will provide you with the insight, knowledge, wisdom and humour for your everyday survival. So you may overcome daily disappointments, setbacks and obstacles. Animal Reflections helps you to become tolerant and accepting of others. The information contained will encourage you to become who you truly are, to realize we’re not separate and on this journey of life on our own. We are all connected and here to help and support one another. Every creature has its own message that can be positive and inspiring or a warning of a challenge or an obstacle that possibly is heading your way. 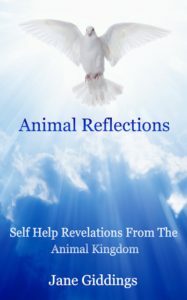 Animal Reflections will help you to become a more thoughtful, caring and understanding person, with a greater self-awareness and balance in your daily life. This self-help book will not only support and guide you but it will change the way you think and act towards the Animal kingdom. guide us when we really need it. Through the Law of Attraction, I will teach you how to understand and interpret the Animal kingdom’s strong presence, personal messages and behaviour. Thereby opening up your mind to the endless opportunities for help, support and spiritual growth. Because as humans we have disconnected from the elements of nature and lost our way. If you are going through a difficult time in your life this book will give you a different perspective, approach and outlook on life. Animal Reflections encourages you stop being a victim and replace hidden negative patterns of behaviour that you may or may not be aware of. You will then be encouraged to take responsibility for your own behaviour and actions, training you to become your own therapist, promoting self-awareness and self-reliance. Are you up for the challenge, ready for change and ACTION? If so and you live in the UK, please click on the Amazon book cover link below , right now! If you are visiting us from the USA, please click on this link Amazon.com for further info.